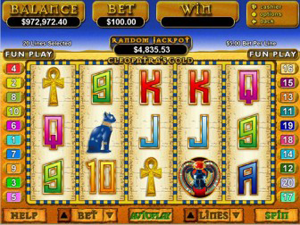 If you love slots and tales of ancient Egypt, you don’t have to look too far to find great quality casino games that marry your loves together. There is no getting away from the fact that money and mystery surrounding ancient Egypt is a big draw for casino operators and when it comes to Egyptian elements, there are none more enticing than Cleopatra. This is why Cleopatra’s Gold is just one of the many different Egyptian and Cleopatra themed games on offer but this game is attributed to Real Time Gaming. This should provide players with a strong sense of confidence of what this game can offer because this is one of the major software providers. 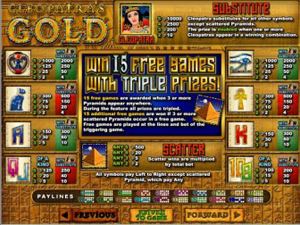 Cleopatra’s Gold provides five reels and 20 pay-lines which is fairly standard for an online slot game these days. There are still plenty of casino players that prefer to stick with the classic 3 reel slots but given the way that video slots are moving the industry forward at a great pace, it may be that Cleopatra’s Gold and other five reel, 20 pay-line slots are seen as being quaint slot options before too long. It is unlikely that you will be blown away by anything that Cleopatra’s Gold has to offer but that isn’t what every player is looking for. If you are looking for a reliable game that will provide a great deal of fun, this is going to be exactly the sort of game you are looking for. The coin value associated with this game runs from $/£/€0.01 to 5 and there is a maximum of 20 coins that can be used in this game. This means that the maximum amount of money that can be placed on each spin is $/£/€100. This is a lot of money for a single spin of a slot machine so anyone looking to sink a lot of money into a slot may find that this is an option for them. There is no need to spend a huge amount of cash to enjoy what this game has to offer though and players looking for fun at a low price can take a great deal of entertainment from Cleopatra’s Gold. The Wild Symbol for the game is Cleopatra herself and the Scatter Symbol is a pyramid. This adds a further level of authenticity for Egyptian lovers and it is fair to say that this game will appeal to die-heard slots fans and people who appreciate what ancient Egypt has to offer. There is a progressive jackpot element to this slots game and this is something that is likely to be of benefit to a lot online casino players. The chance to win a life-changing amount of money is definitely something that will appeal to most casino players and this game provides the chance to do so from the comfort of your own home. The fact that Cleopatra’s Gold is a RTG means that players can relax about the quality and style of game that is on offer.